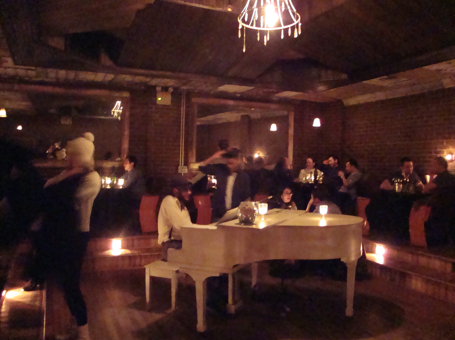 LIve Jazz: Sundays through Wednesdays at around 10:30 p.m.
Another speakeasy impersonation; this one is named after a 1896 law, which among other provisions, prohibited the sale of alcoholic beverages on Sunday—except in hotels. Most men worked a six-day week, and Sunday was the only full day for drinking at saloons. NY State statutes allowed any business to be considered a hotel, if it had 10 rooms for lodging and served sandwiches with its liquor. Saloons quickly found a loophole by adding small furnished bedrooms and applying for a hotel license. Dozens of “Raines law hotels,” often located directly above saloons, opened. This led to the transformation of saloons into hotels, which in turn led to an increase in prostitution. As for this bar, they really go all the way, from the unmarked entrance and doorbell you have to ring to get in, to the very well done 1920’s looking interior complete with the obligatory tin ceiling. There are no beds, but some tables have velvet couches and black gauze curtains: each comes equipped with a wall buzzer to call your waitress, There is a small garden in back. The weekends can get busy, so this place is better visited during the week. The cocktail list comes from a former Milk & Honey bartender. Their motto is “not done fancy, just done right.” Although the Richardson seems like the typical and latest speakeasy reincarnation, they make an effort of avoiding the attitude, pretense or fuss that usually goes with these places. The self referred bartenders (not mixologists) are helpful and polite, maybe it is because they are in Brooklyn or maybe it is because they are told to be nice. Either way expect designer cocktails with a chill and slightly younger than usual crowd.